What's the Value of Your Employment Brand? 1) Investing in your employment brand will save you money: We surveyed 2,250 corporate recruiters in the US to learn more about time to hire, cost per hire metrics and most importantly the impact of a strong employer brand. We have seen that companies that have strong employer brands enjoy significant cost savings with lower cost per hire and employee turnover rates. But by how much? This is where the data gets very interesting. 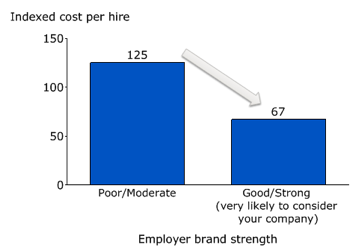 The cost per hire is over 2 times lower for companies with strong employer brands. Companies with stronger employer brands have 28% lower turnover rates than companies with weaker employer brands. 2) We tend to over-inflate perceived attractiveness of our company: In the same study, we asked recruiters to rate their self-perceived attractiveness of their company as a place to work. * Almost none of the recruiters claimed that their company would score less than a 7. Passive candidates are more attracted by opportunities that offer challenges and the ability to make an impact. Passive candidates place a higher value on company culture and may even put culture fit above compensation and benefits. Active candidates are more drawn to companies that offer strong growth prospects and opportunities to develop their skills. So what does this data tell us? Developing and investing in your employer brand is critical to not only attract passive candidates to your company, but retain your top talent. While many think their employer has strong appeal, the reality is that most don’t which is another reason to closely look at how your company is really being perceived among candidates and reduce your cost per hire. The perception of LinkedIn is that it is a sourcing tool. While LinkedIn’s Recruiter tool is the backbone of LinkedIn and a tool that continues to change the way recruiters source for talent, the reality of LinkedIn is that itallows you to reach your ideal candidate with precision and scale. Our clients have found huge success branding their companies as employers of choice on LinkedIn, driving awareness via Recruitment Ads, communicating their Employer Value Proposition on LinkedIn Career Pages, and most importantly driving referrals by branding their Employees’ profile pages.